After my 100 lb chocolate lab tipped me over last summer in my canoe and I felt he might tip over the lapstrake rower I build two years ago, I decided that I needed to build a boat he couldn't tip over. This boat is a drift boat aka McKenzie River Boat. They are very common in the Pacific NW and especially so here in Western Montana where we have wonderful, fast rivers. 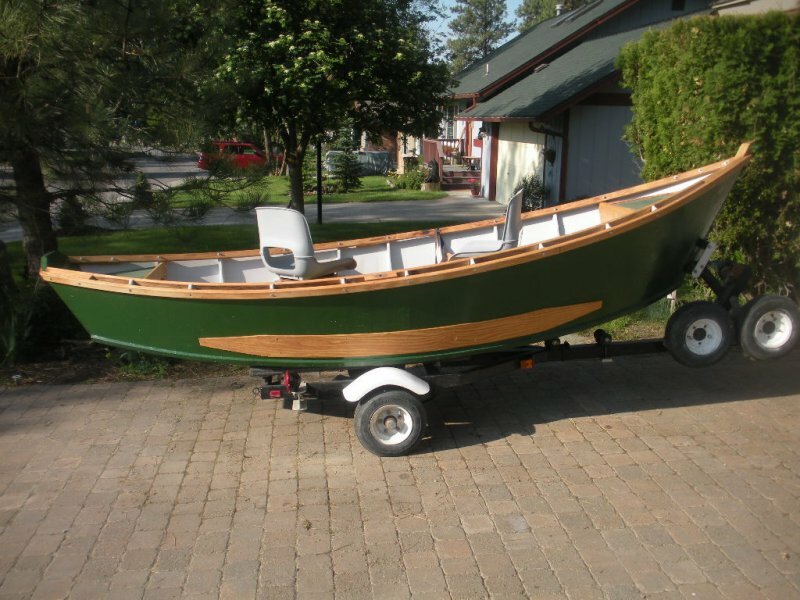 These boats are popular with professional fishing guides here in the Pacific Northwest. They are very maneuverable and turn quickly with oars to avoid river obstacles. Also useful are electric trolling motors such as the Minn Kota motors. I recently added one to my boat for propelling on lakes or slower river channels. I did shorten this boat by two feet, narrowed it by one foot and lowered the sides by two inches from the original plans.Glad I did because it fits my trailer better and is faster on the water. 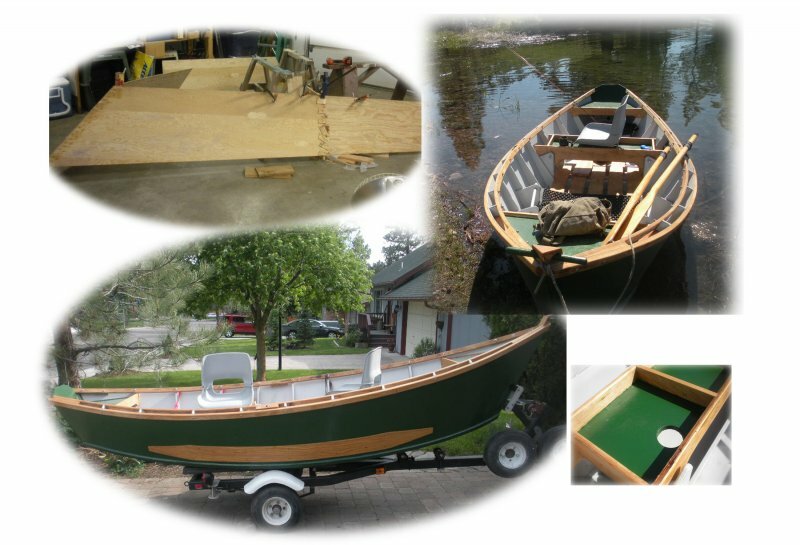 The boat is made from 1/4" marine plywood and a bottom of 1/2" plywood. It has ribs of coast fir and all trim, chines,battens, etc. are made of red oak. 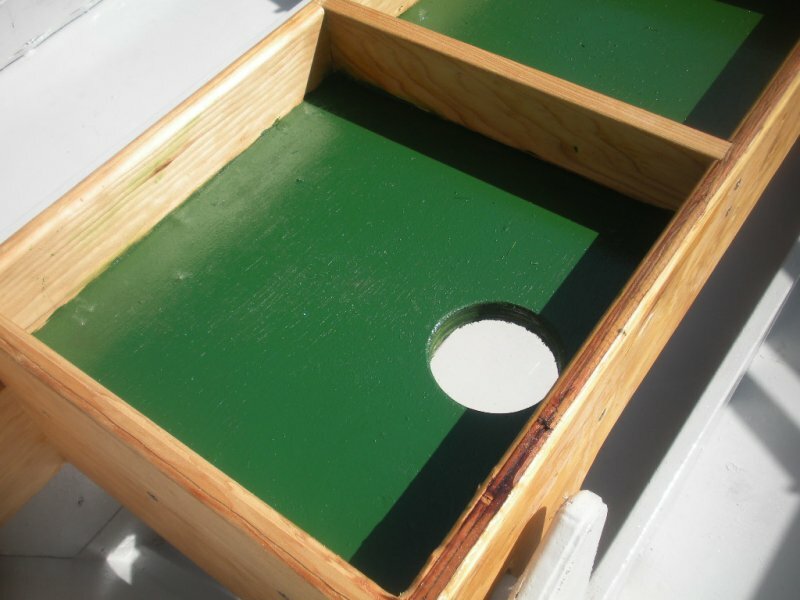 The hull is painted with Epifane Atlantic Green. The interior of the boat is painted with a light gray floor paint. Rather than lop off the bow stem, I ran a dowel through it which is useful to grab onto and hang a rope or bucket, etc. The boat seats swivel and are mounted on removable bunks. I started this boat in early January and finished it in mid-May after 500 hours. Construction included about 800 stainless steel screws.